And thus I continue my look back to the past short film projects I have made with Gary O’Brien under the Fix Films umbrella. A FAR CRY (2006) was our second short film. It was also our most expensive. I admit I got myself into some debt on a credit card/overdraft for this film. I’d finished my Master’s Degree a couple of years before. I had hope that if I made a great short film I could possibly ignite a career as a writer or producer or both within the British Film Industry. At the very least I had hope I would have a show reel piece and even if I started at the bottom I could work my way up within a reputable production company. I was wrong. But I was naïve and ambitious and that drove the whole production. I have no regrets though as A Far Cry is — despite its many faults — is a brilliant short film. It all started one drunken evening in Ascot somewhere and myself and Gary had enjoyed the process of making our first short film — the revenge comedy Getting Back Mr Hunt (2005) which you can read about HERE — SO much we crazily thought let’s do another one. What followed was a crazy, stupid and wholly memorable experience as we put A FAR CRY into pre-production. 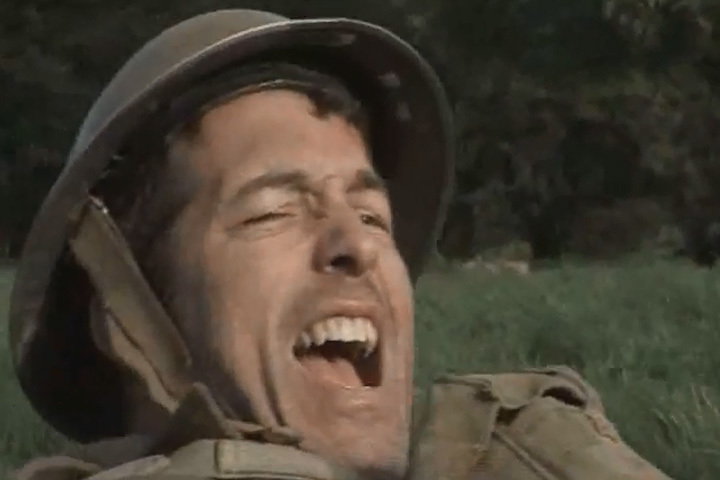 I cannot quite recall why we chose to do a war film. I guess because we both love war films; and didn’t think it through properly in regard to the amount of work that it would entail. I know we definitely wanted to do something involving a moral dilemma where the main protagonist had an impossible decision to make. We wanted the audience to ask themselves: “WHAT WOULD I DO IN THAT SITUATION? !” Moreover, as it’s a war film it obviously had to be bad. Really terrible. A decision that would haunt the character and the audience. I think with THAT ending we achieved that. So, eventually we spent months on the screenplay batting it back and forth until we’d moulded something we were happy with. Only then did we dip our toe into the casting and crew side. This, for a small group of creative and deluded fools, was a massive undertaking. 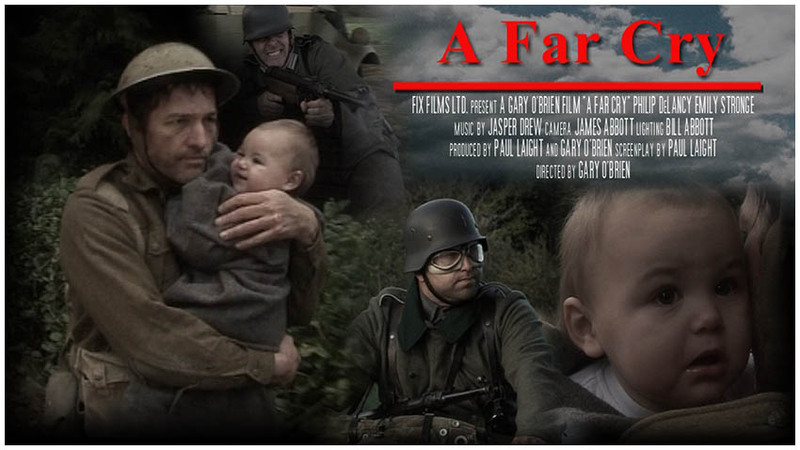 We were making a 15 minute short film set in World War II which involved: a big opening battle scene; a baby; marauding German soldiers hunting down our protagonist; AND it was set in FRANCE!! To put it in perspective the budget for Saving Private Ryan (1998) was $70 million; ours was a one-hundred-thousandth of that. Did that stop us? No! We managed to source a baby via Gary’s great mate Toby and to him I will be eternally grateful as we could not have made the film otherwise. Likewise, we needed a massive location somewhere in the middle of nowhere where we could recreate the big opening battle scene and others. Sometimes in life opportunity just comes knocking and we were at a party on a farm in Watlington, Oxfordshire and the owner — who I only ever knew as Murray — said we could use his land for a bottle of booze. So, for free we had a baby and for some scotch we had a farm and a few acres with which to continue this creative folly. Next stop was sourcing some Germans. I was sure the whole venture would collapse. But DID YOU KNOW there are groups who recreate WWII battles as a hobby! I didn’t but we met some cracking guys from the WW2 Re-enactors Group led by Mark Craig and Jason Lavene and they were incredible. They loved dressing up as Germans and rather cheaply gave us the use of all their guns, uniforms, props and most importantly themselves and their time to make it happen. We had some ups and downs while making A Far Cry but when I look back I think that through sheer will and hard work everything went amazingly well. 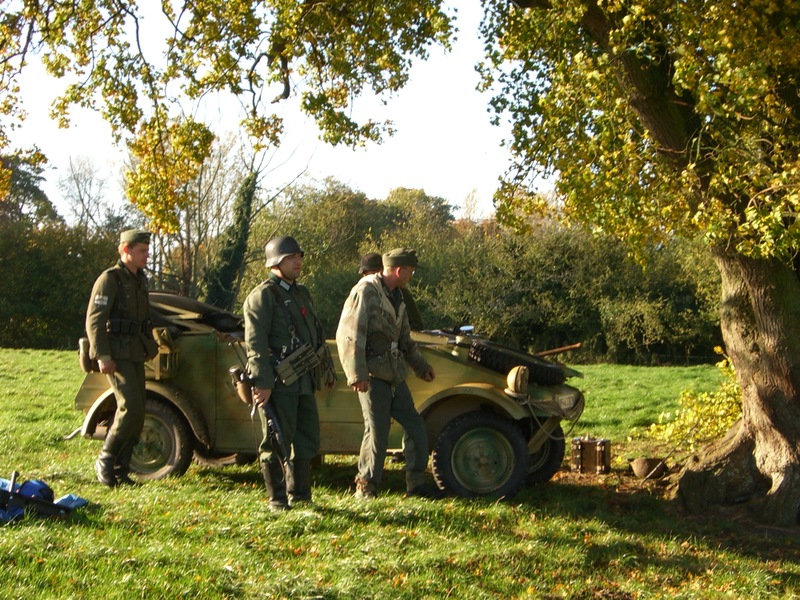 The WW2 Re-enactors were brilliant and I had to laugh on the first day of shooting when they woke up in the morning expecting their to be a Catering Truck serving hot food only to be told that there wasn’t a budget for that. Did they complain? Not at all. We had a laugh about it; well me and Gary did. While I imagine they were cursing us they soldiered on and gave their all in the production. Filming of A Far Cry was done over a couple of weekends. One in Watlington, Oxfordshire. The other in Ascot, Berkshire. We shot quickly and economically and looking back at the film now I have to say Gary did a brilliant job of crafting some very memorable set-pieces throughout. As the producer it was my job to keep things steady and moving along and manoeuvre all the units into place. Oh, and I made A LOT of sandwiches. I think the whole project worked because everyone was pulling in the same direction and enjoying the experience. The opening battle was a lot to take on and we did overrun in regard to timing but due to Gary’s excellent storyboards and a script we knew back to front we were able to keep on track on the whole. The pouring rain on the Sunday, I think, really put us back but we managed to pick up the scenes we lost during the first weekend when we shot in Ascot. Often we had to improvise and compromise but we did it inventively to make the story work. I recall the filming process being one of very long days and buzzing urgency with all manner of friends and family helping out on different days. It was incredible feat to make this film for so little money. Even stuff like recreating the barn in a garage in Ascot came off; Gary actually hired bales of hay from some random rural folk who then came and collected them the Monday after shooting. Of course, our cast were awesome and special mention for our lead actor Phil Delancy who gave a great performance and anchored the film with gravitas, physicality and emotional depth. Without him the film would be nothing. Once the shoot was over we had a hell of a lot of sweat, time and insanity in the can and it was down to Gary to edit it into a cogent whole. That he did with tremendous endeavour as the film flows brilliantly with a fine combination of action and suspense. We had a great script in our view with a brutal subject matter and even darker ending. I was very happy with what we had and when I started seeing the footage I was elated. I was, by day, an office clock-puncher with a dead-end job but over those two weekends I had lived the dream of being a filmmaker. I WAS a filmmaker; albeit on a budget that wouldn’t pay for Robert Downey Jnr’s on-set beard stylist. I re-watched the film again yesterday for this little piece and it stands up very well as a story. I also think Jasper Drew’s score is wonderful. I think we clearly aimed high with this production and it’s the lack of budget shows, however, everybody involved with this film worked REALLY hard to make it work and I think we did the script justice in the time we had. I thank everyone who assisted in making the film become a reality. What started on a crazy, drunken night in Ascot became one of the biggest projects I’ve worked on. You may say I’m and idiot for following a dream. But I’m a very proud idiot. No one can take that or this film away.